Every Saturday I usually hit our local farmers market solo. Matt works on Saturday's & I've just turned it into a Self-Care Saturday ritual that I look forward to oh so much. I love the feeling of slowly making my way out of bed on Saturday, brushing my teeth, throwing on some clothes & grabbing my bags to see what the market has for me. Sometimes I come home with every bag full, while others times I come home only with one or two things. Regardless, the ritual itself slows me down so much & truly fills me up. This past Saturday I had a friend join me who has been asking for some insight into nutrition & my world inside the kitchen. I'm so used to being on my own at the farmers market & in my kitchen, (I actually shoo my poor husband out of the kitchen when he tries to make his way in while I'm cooking) so this was a new experience for me. & let me tell you, it was so enjoyable! It truly was so nice to share the kitchen with my sweet friend. To be honest, it inspired me & sparked a creative spirit in me that's been MIA for the past month or so. Being in the kitchen & being able to give insight on certain things to my friend made me realize how second nature some things are to me, but how valuable that insight can be to others. Running on this inspired energy has had me in the kitchen most of the weekend & into the week playing with different recipes. (Matt is also out of town for an annual boys trip to Mexico. Soooo, I might be trying to keep myself busy to make the time go by sooner!) Regardless, I've been enjoying my extra time in the kitchen & have loved being able to create more recipes for you guys. Enter stage left, this Creamy Coconut Quinoa Turkey Taco Bowl. Say that 3 times fast! We all know I like my bowls, but this bowl has to be my favorite so far. 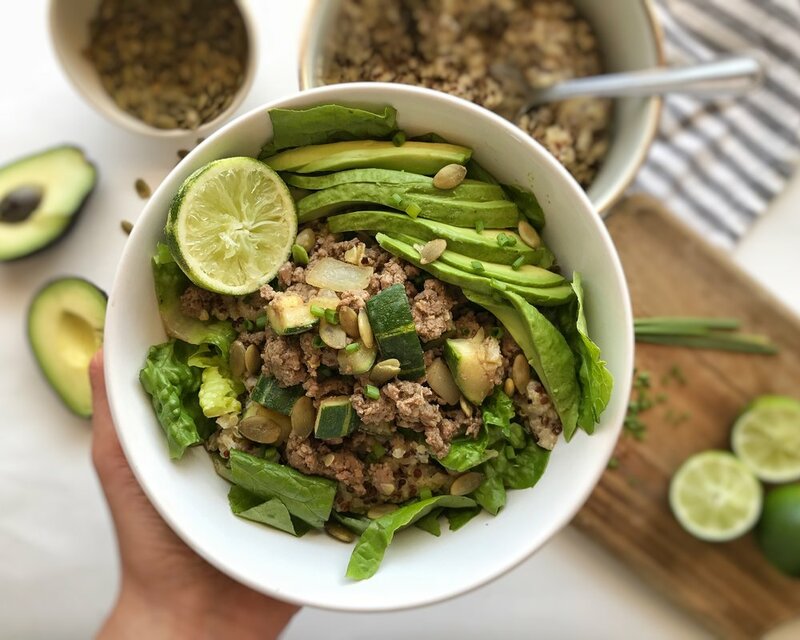 From the creamy-tangy coconut-y lime quinoa, to the savory sautéed zucchini & turkey... this bowl is a winner. Bonus: its gluten-free, dairy free, paleo, & can be made vegan by subbing the turkey for your favorite legume or organic meat substitute. Start by sautéing minced garlic in oil of choice over medium-high heat until fragrant in medium sized pot. Add in sprouted quinoa, coconut milk, bone broth (or water), lime zest & juice. Let come to a boil then reduce to a simmer & cover, stirring every so often. Quinoa is ready when all the liquid has been absorbed & you can fluff with a fork. Heat 1 tbsp oil of choice in cast iron skillet over medium heat. When warmed add in chopped onion & cook for about 5 minutes. Add in chopped zucchini & cook for another 2 minutes. To the skillet, add in your ground turkey (or legumes to make vegan) & all spices. Continue to cook over medium heat until turkey is cooked through. Finish with a fresh squeeze of 1 small lime & transfer mixture with slotted spoon to serve immediately over your favorite greens, coconut quinoa, & top with avocado, fresh chives & pumpkin seeds or any toppings you desire. You can store in an airtight container in the fridge for up to a week. Enjoy!